Now this, I want to see…. 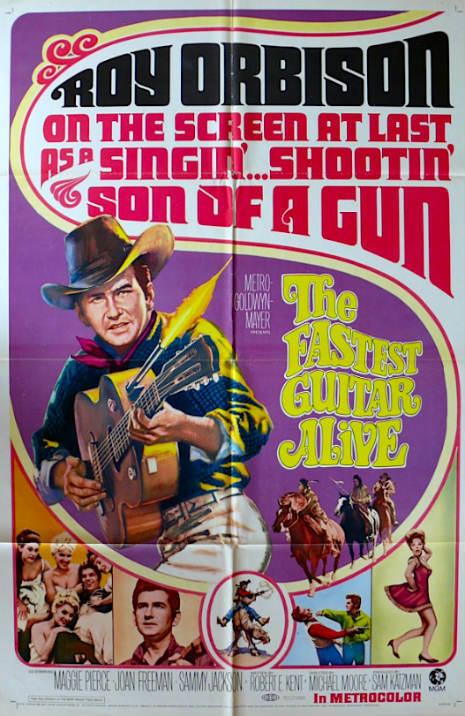 Roy Orbison’s 1967 film saw him star as Johnny Banner, a Southern spy, with a bullet-shooting guitar, who has a plan to rob gold bullion from the US Mint, in San Francisco, with the aid of the Confederate army. This was low budget fodder, scripted by Robert E. Kent (best known for Diary of a Madman and Rock Around the Clock) and directed by Michael D. Moore (who later worked as Second Unit Director with Steven Spielberg on Indiana Jones), and is now best known for its 7 songs performed by the the Big “O”.